All the dignity at a fraction of the price. 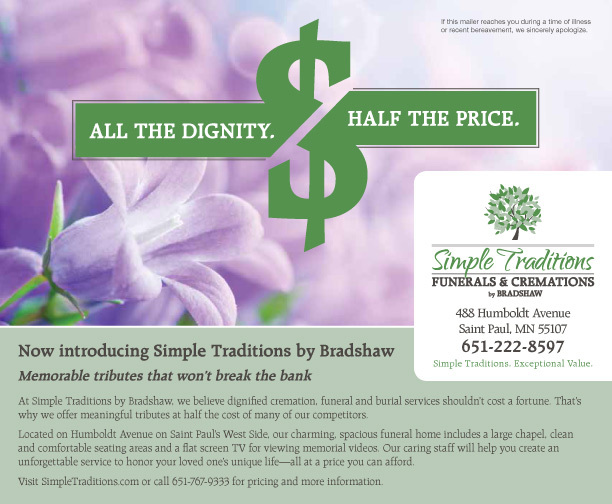 At Simple Traditions by Bradshaw, we believe dignified cremation, funeral and burial services shouldn’t cost a fortune. Especially when the loss of a loved one has already devastated your family. That’s why we offer meaningful tributes at half the price of our competitors. At our newly renovated funeral home on Saint Paul’s West Side, we offer a wide range of inexpensive burial and cremation options that will help honor and celebrate your loved one’s life without breaking your budget. Let our caring staff help you create an unforgettable service to honor your loved one’s unique life. Visit SimpleTraditions.com or call 651-222-8597 for pricing and more information.